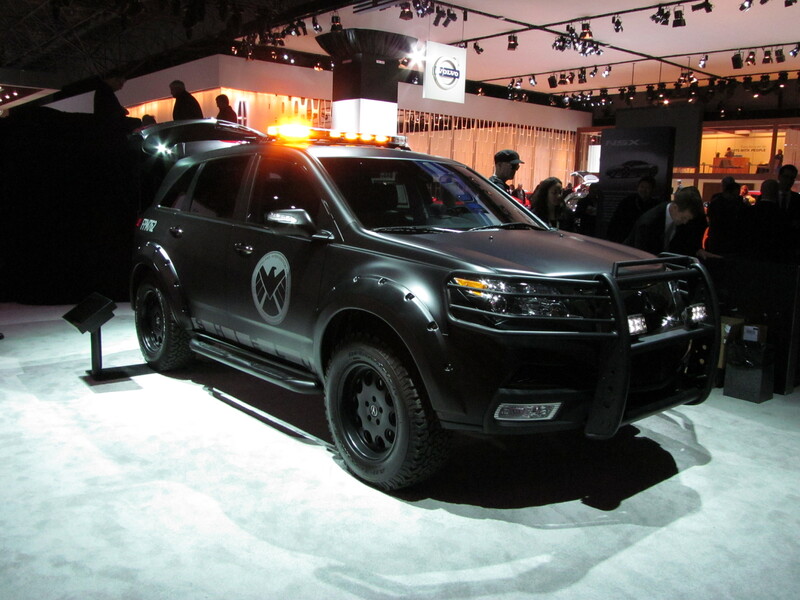 Continuing this week’s Avengers theme, I thought I’d take a look at this bruiser of an SUV. It’s actually an Acura MDX, the car Westchester moms drive to the mall. However, it has been rebuilt by S.H.I.E.L.D., the top secret security agency that watches over the United States in the Marvel Comics universe. That’s quite an endorsement, huh? Acura has always been a low profile brand; even the current spaceship-like TL fails to turn heads. That’s why Acura is taking over the Marvel universe. Last year, S.H.I.E.L.D. agents chased Thor around a desert in a fleet of Acura SUVs. Honda’s luxury division returned as the official car of S.H.I.E.L.D. in Avengers. This was actually a brilliant move. It got Acura plenty of exposure (Avengers broke the record for highest gross on opening weekend), particularly with an untapped market segment: nerds. Nerds generally aren’t car enthusiasts, so they don’t have any preconceived notions about the brand. They also like technology, which Acura has plenty of. They are also more than likely to buy a car just because Nick Fury drives it. Does the car fit the role? Acuras look suitably futuristic, befitting an agency that has a helicarrier, and they look downright awesome decked out the way this show model is. Is it odd that S.H.I.E.L.D. has Japanese luxury vehicles when every other government has Fords and Chevys? Sure, but this is a comic book movie. As long as the Avengers beat the bad guys, all be well. If anyone happens to notice the black SUVs in the background, Acura might make a few extra sales.